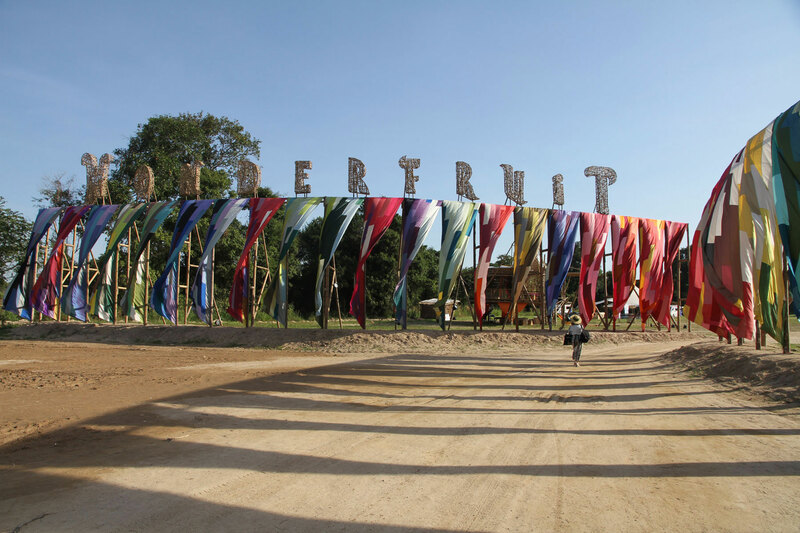 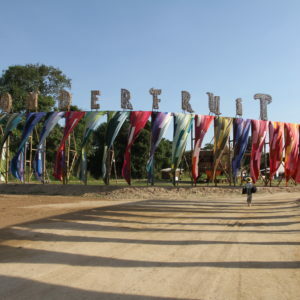 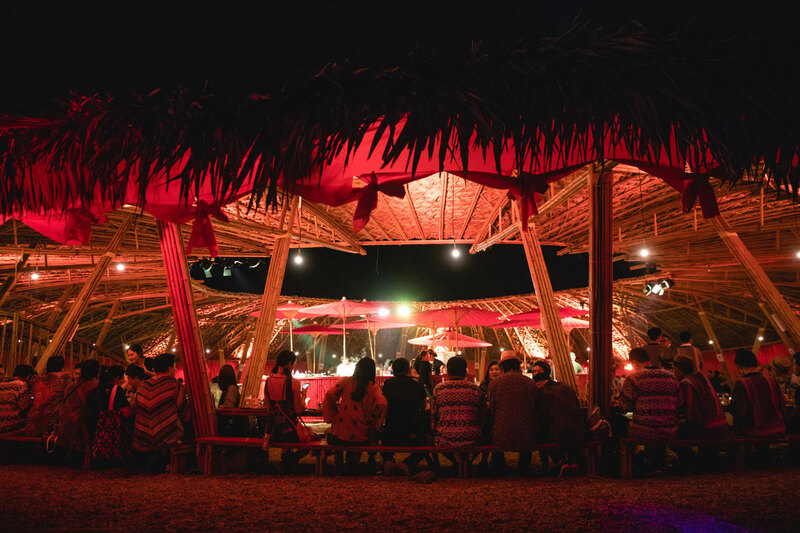 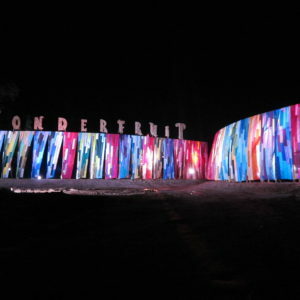 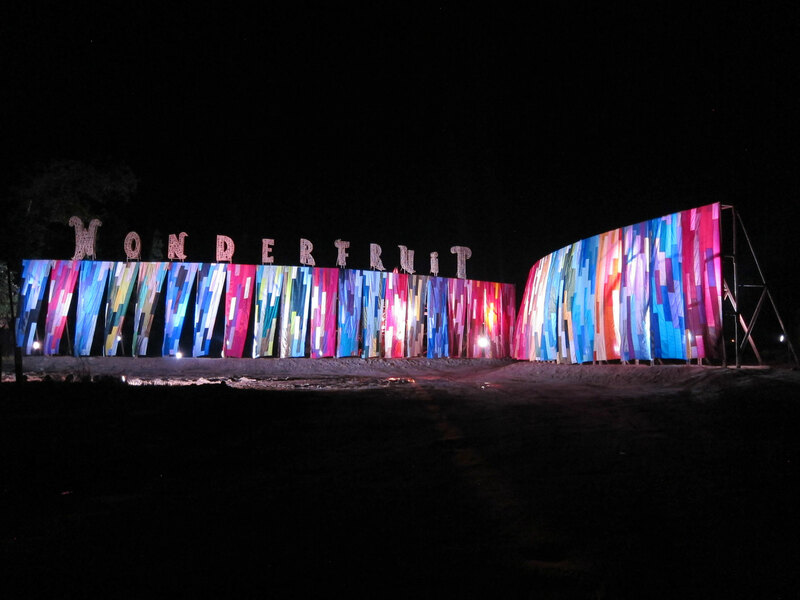 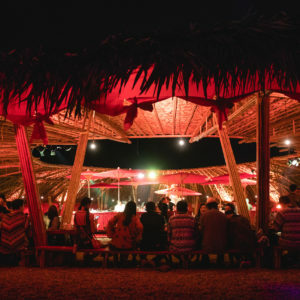 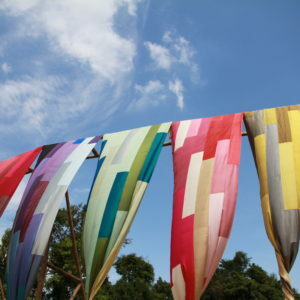 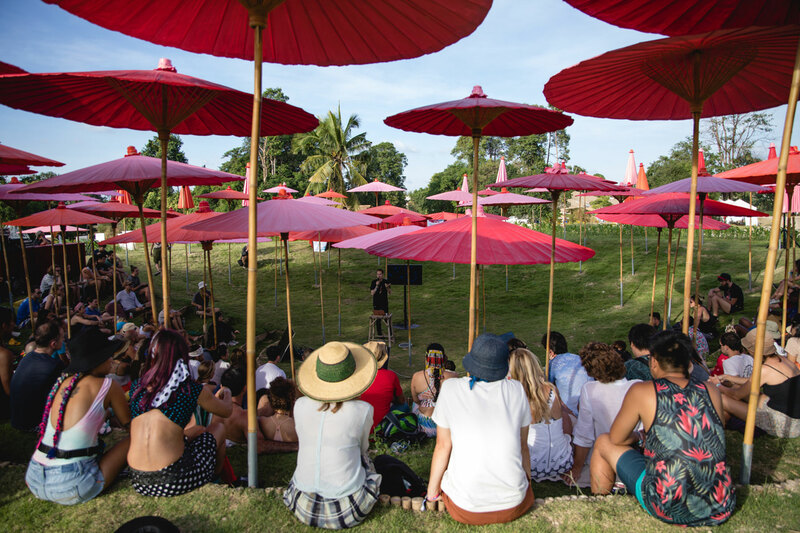 Brief: To design a series of sustainable structures and immersive experiences for the Wonderfruit Festival – a movement that celebrates art, music and food as a way to catalyse positive environmental impact. 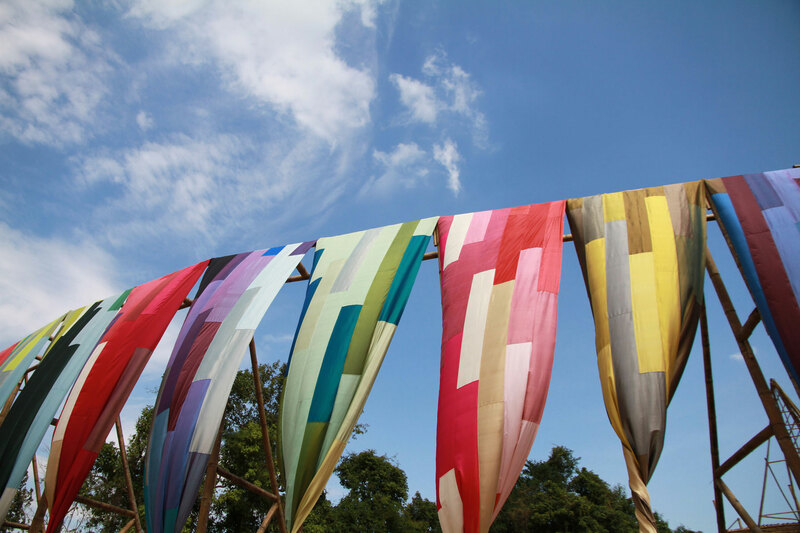 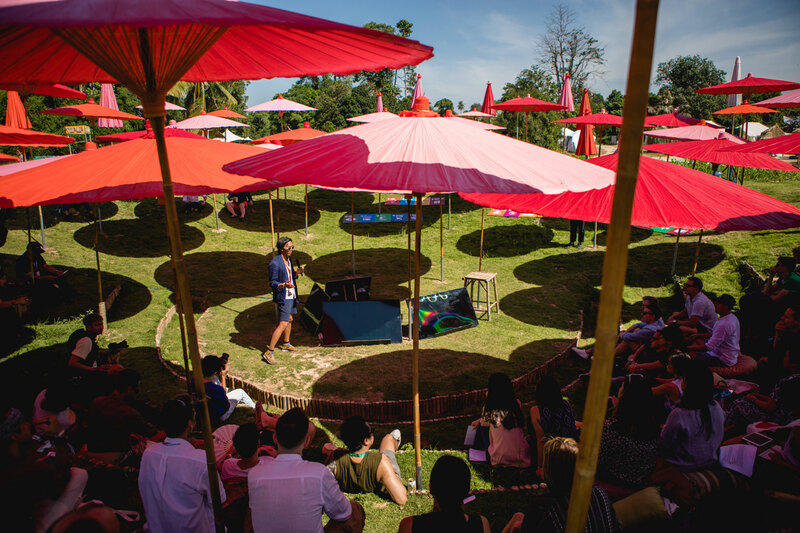 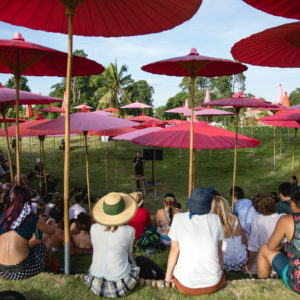 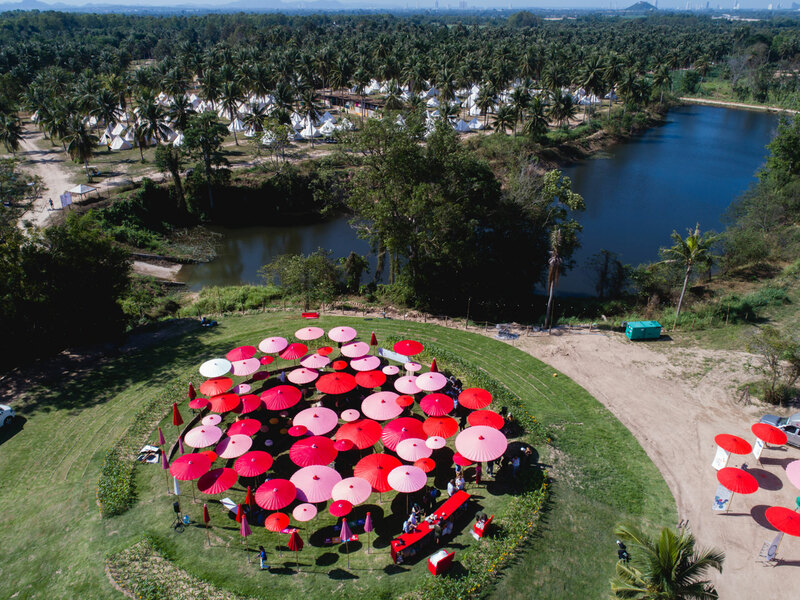 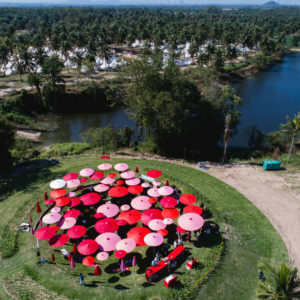 Located in a site in the untouched hills 10km west of Pattaya on the Gulf of Thailand, the interventions and structures of Wonderfruit 2018 were conceived to celebrate the indigenous craft of the area, using local materials and a family of red finishes to compliment the lush greenery of the area. 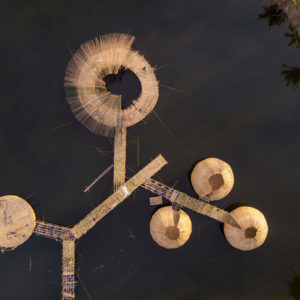 ARD also undertook the masterplanning of the site, to ensure the elements introduced hold dialogue with its context – the landscape and its adjacencies. 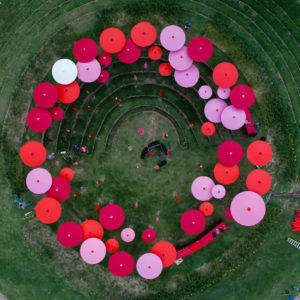 Its forms have been derived from a collection of sensual radiating circles that connect the different activities in sympathy with the fact that sound does not move in lines but circles and as a metaphor for sustainability, which underpins every element of the brief. 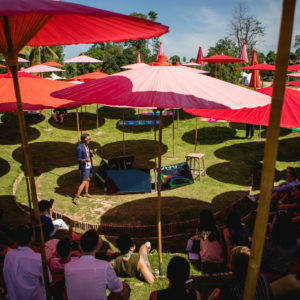 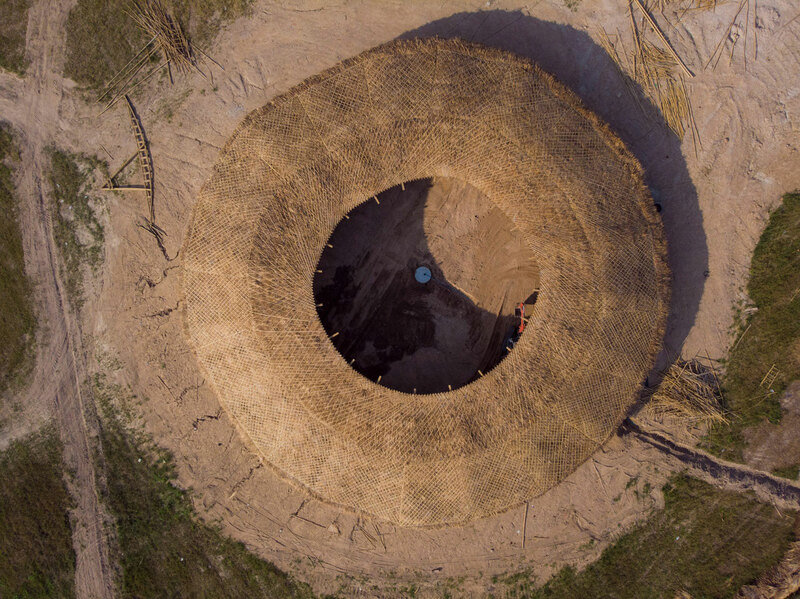 Designed to hold symposiums, talks and events on the theme of sustainability the Eco Pavilion consists of a meadow of Thai grass and an enclosed ring of radiant yellow maize that acts as a living facade and an acoustic barrier for the pavilion within. 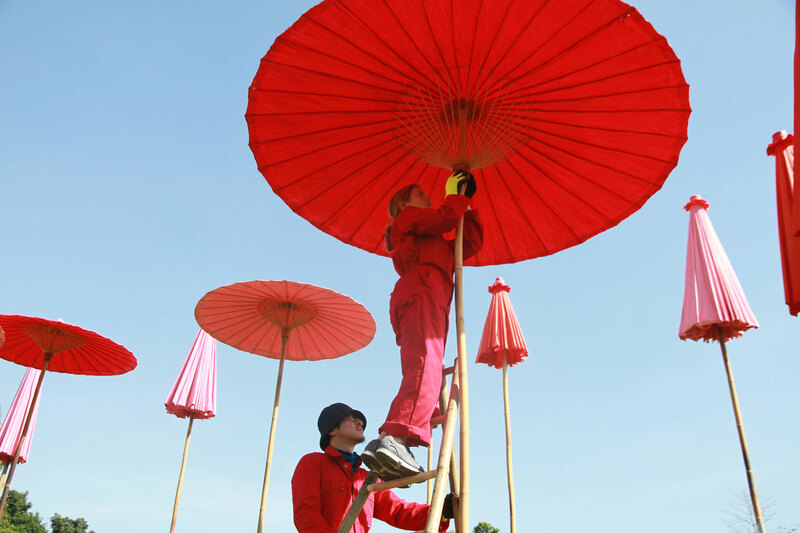 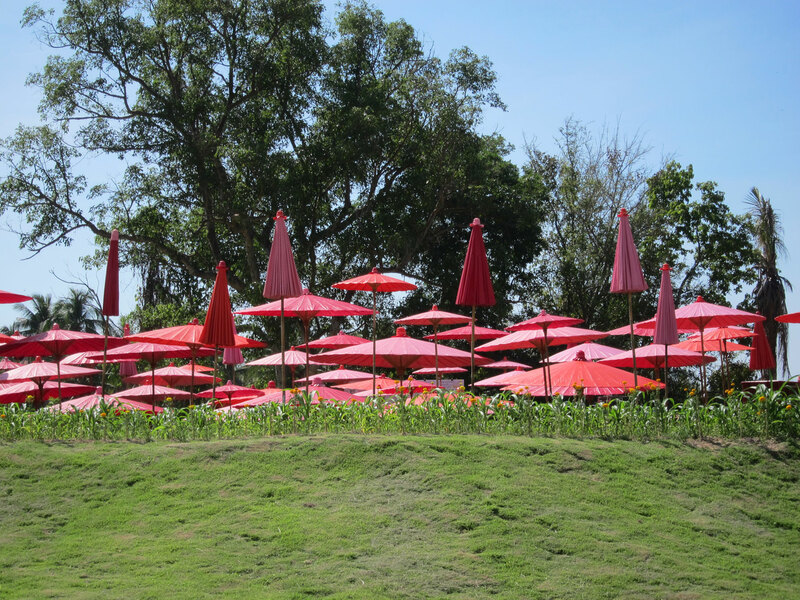 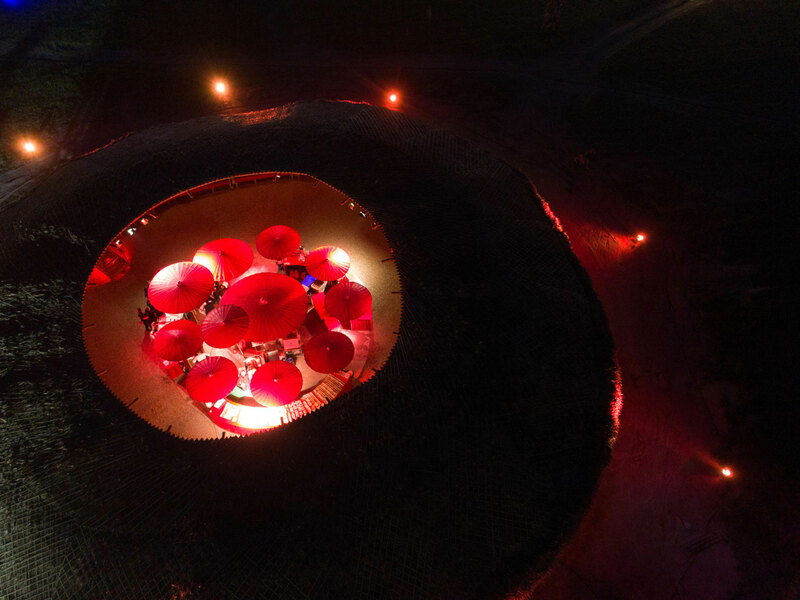 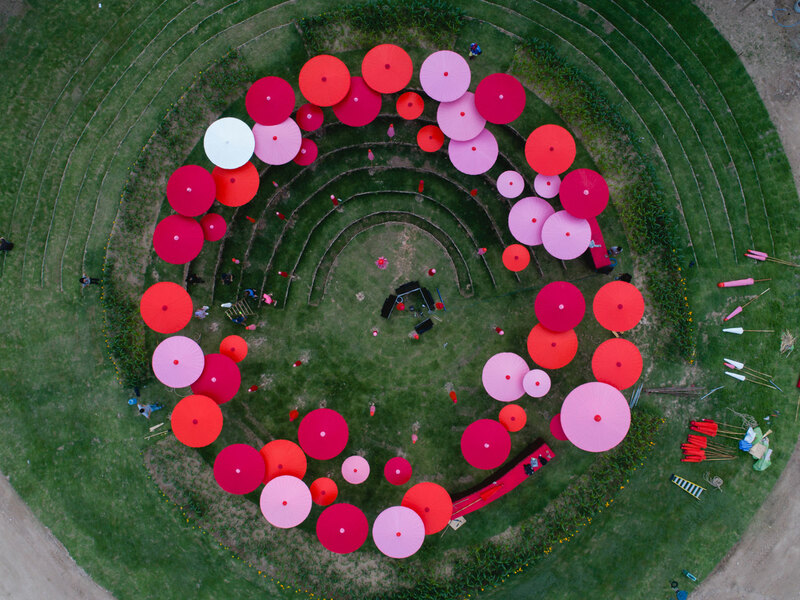 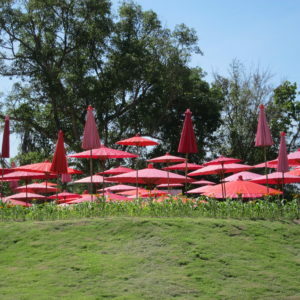 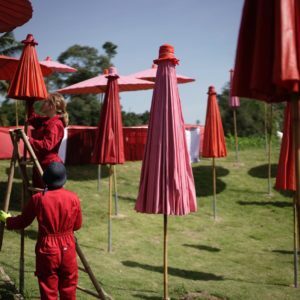 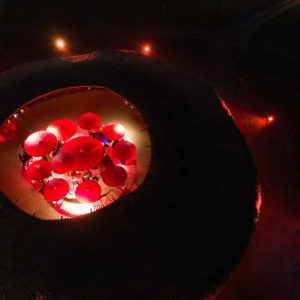 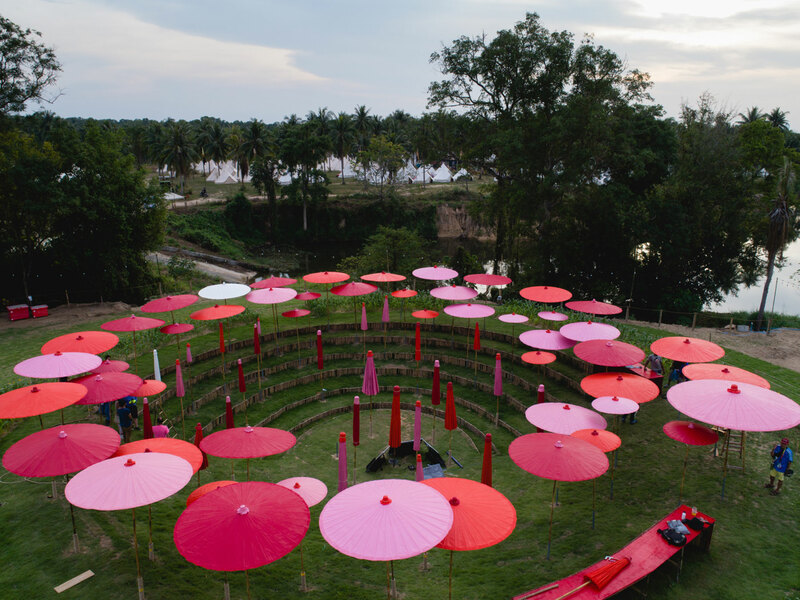 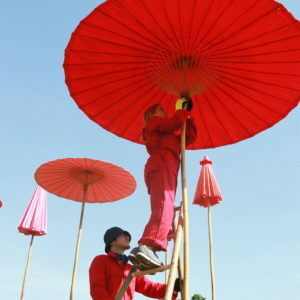 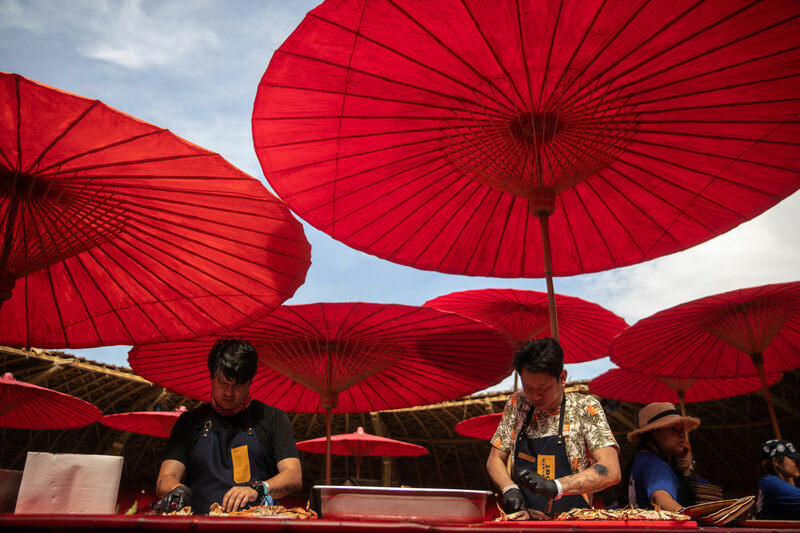 The pavilion itself is comprised of 124 hand-made, hand-painted cotton umbrellas in shades of red, pink and orange, sheltering a man made crater beneath. 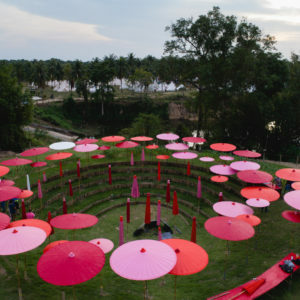 A self-contained landscape in its own right, whether used for lectures where the audience is sheltered by the umbrellas and the speaker stands in the centre, or for promenade performances where the circle is enhanced and expanded, the Eco Pavilion has been created to respond to the needs of the activity it contains. 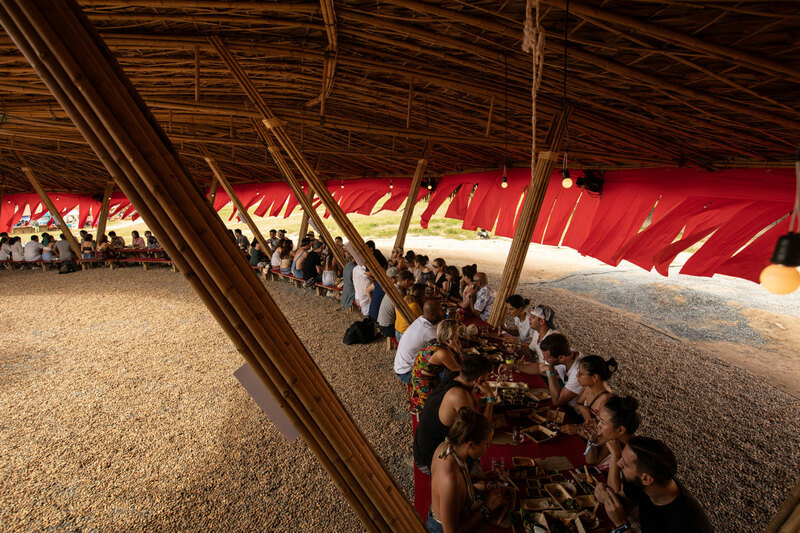 To offer Wonderers an exciting place to eat we created a permanent structure, The Theatre of Feasts, designed around the ritual of eating. 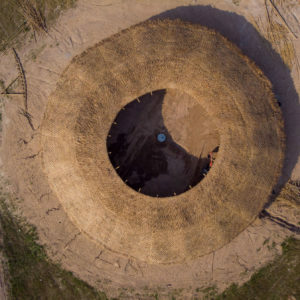 Fully open to the elements, its roof is made of woven palm leaves to keep diners cool and make the structure strong, allowing for a hole in the centre that acts like a sun dial, maintaining connection to the wider site and the shifting light of the day passing outside. 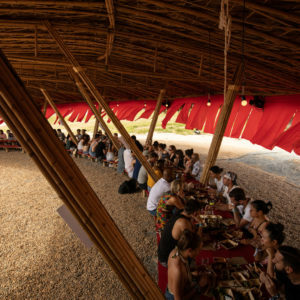 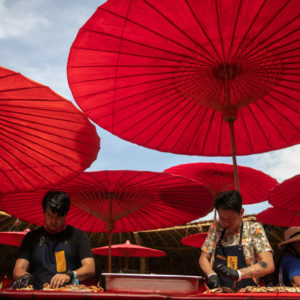 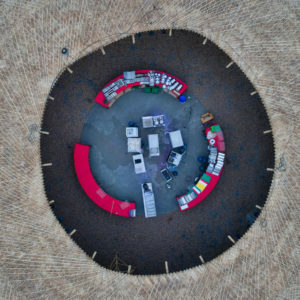 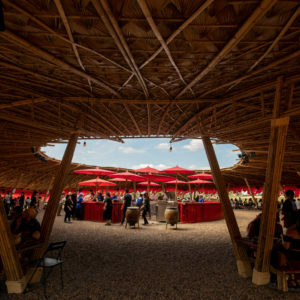 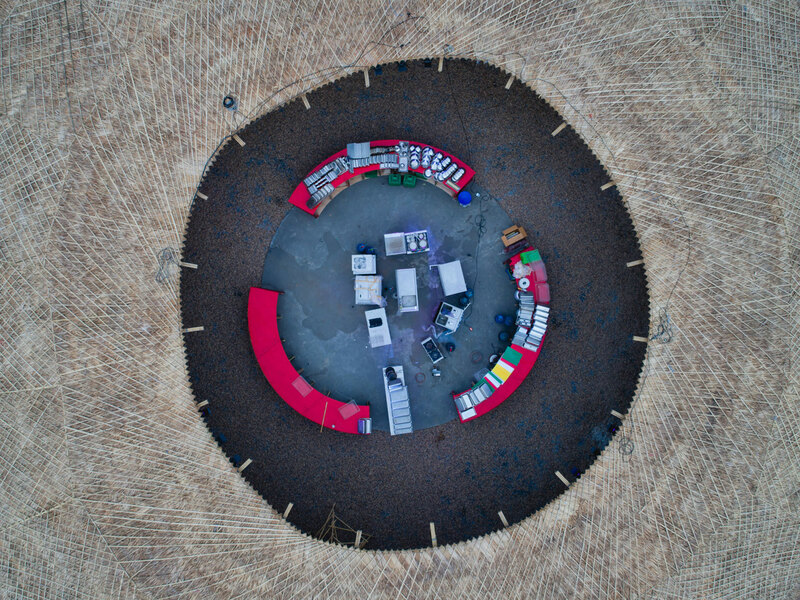 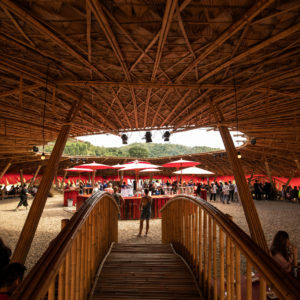 Inside, an uninterrupted circular table curls its way around the perimeter of the tent, allowing 275 people to dine together, sheltered from sun and rain by the giant bamboo dome overhead. 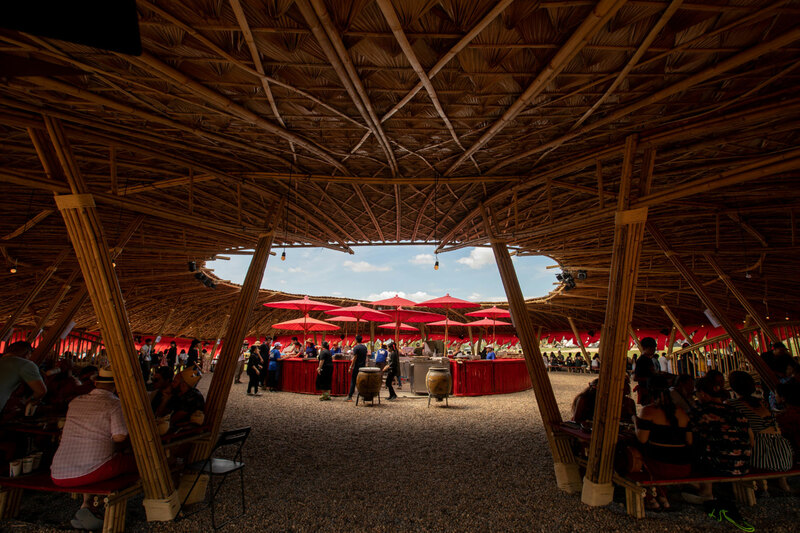 In the centre of this ring of tables is a vibrant red bamboo kitchen, establishing a performative relationship between the chefs, the diners and structure that contains them. 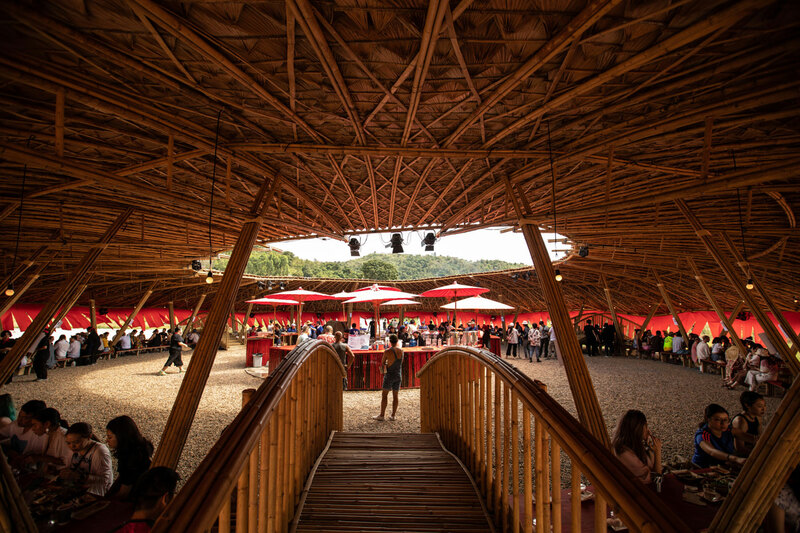 Under foot a dusty orange pebble floor creates a tangible sense of arrival, of crossing a threshold into a warm, vibrant and intimate social space. 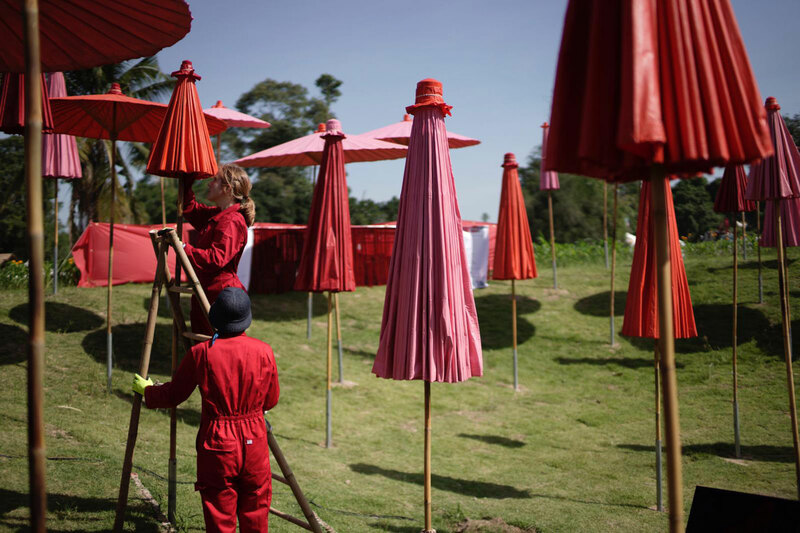 This giant tent is concealed by a red fabric curtain and beyond it a fledgling, supporting structure contains a small stage for musical performances. 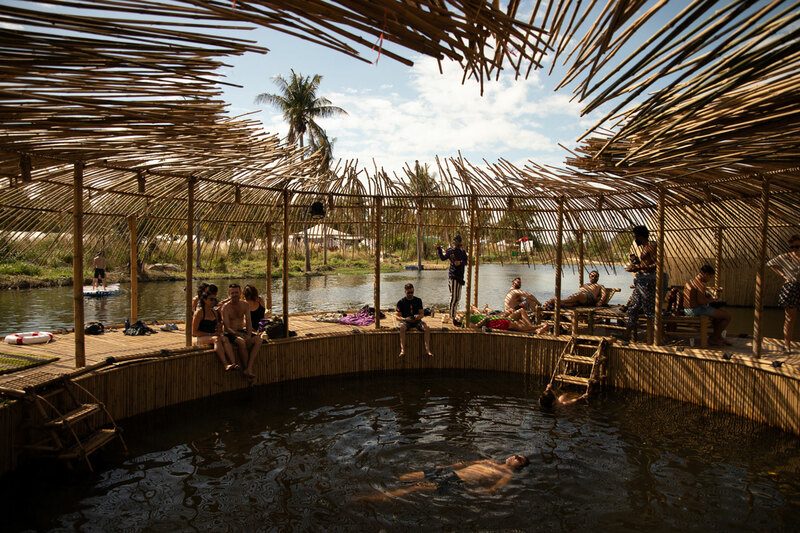 As an oasis of calm within the pulsating energy of the wider Wonderfruit experience, we designed The Bath House, made up of a series of fit for purpose structures to support – drinking, bathing, performing, relaxation, massage and contemplation. 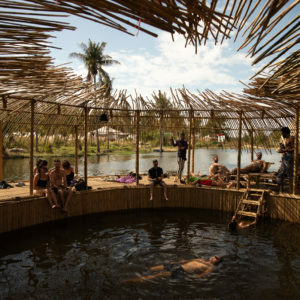 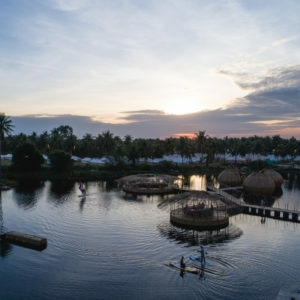 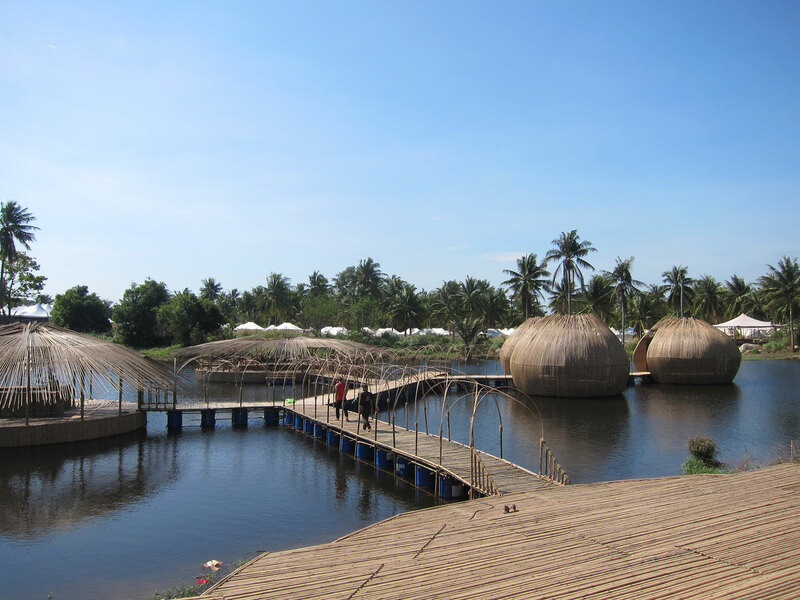 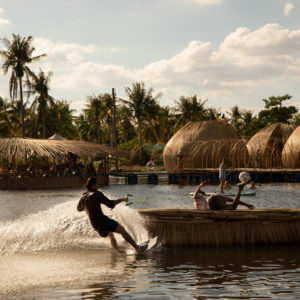 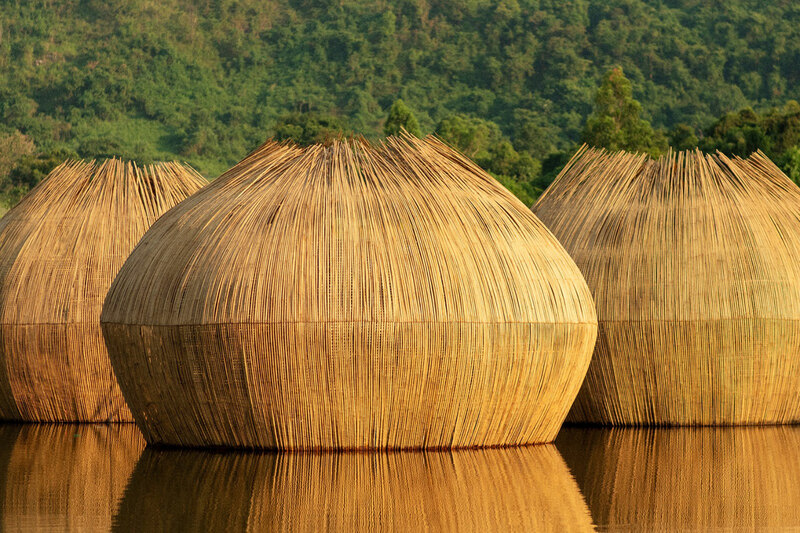 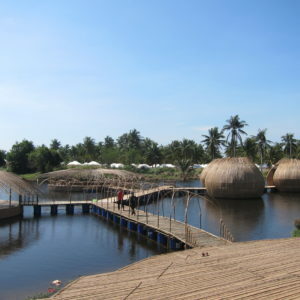 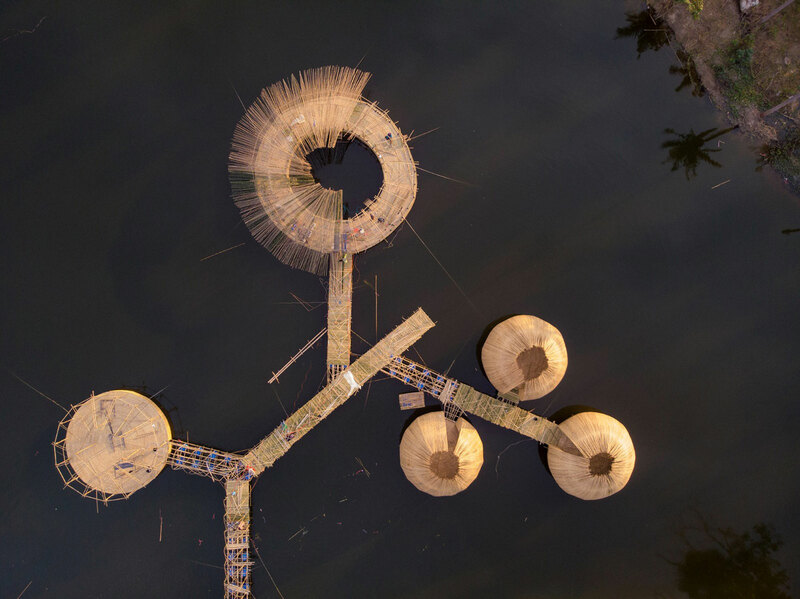 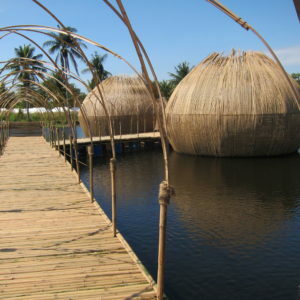 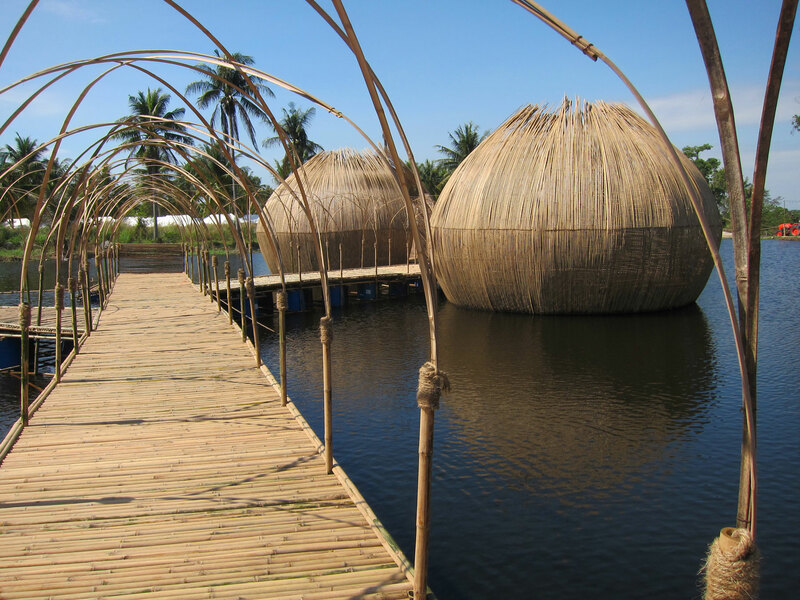 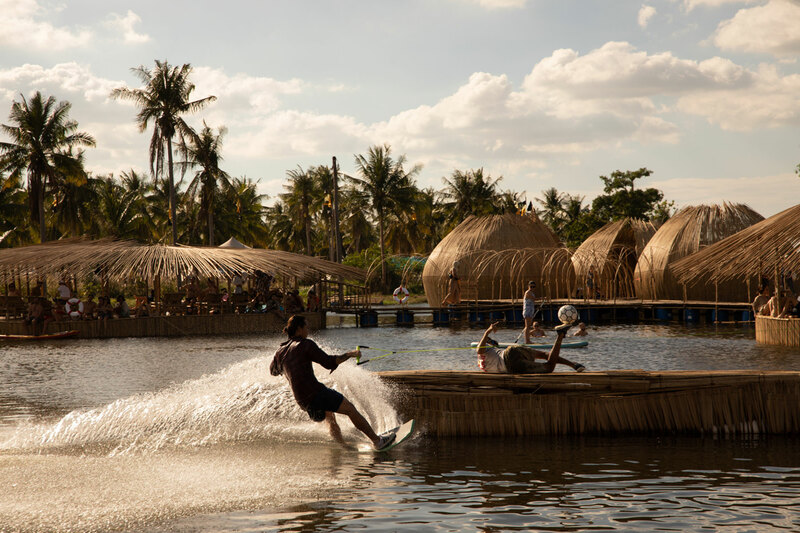 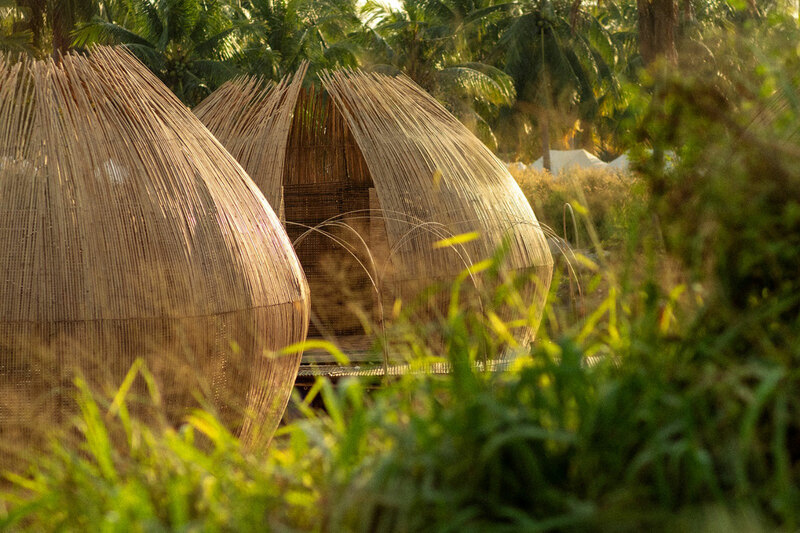 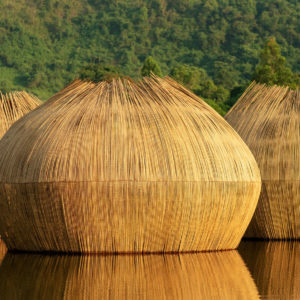 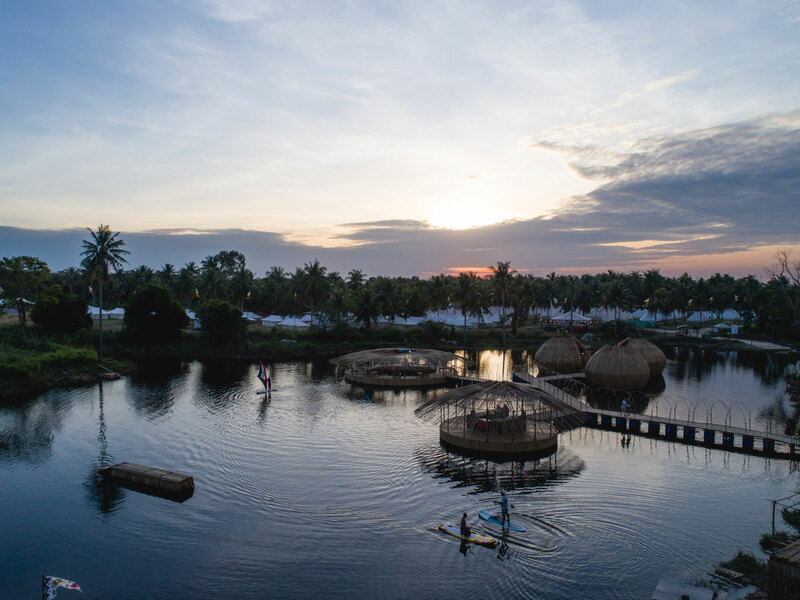 Formed from a connected network of pontoons and floating pavilions, inspired by Thai fishing villages that appear from nowhere, it offers an opportunity for quiet reflection, taking you on a explorative journey through the power of water via various nurturing bathing rituals. 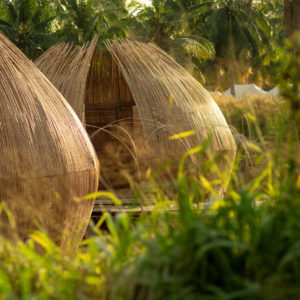 Each structure has been designed to filter light out or let an optimal amount of soft, dappled light in, depending on the treatment it hosts.